Many of you have commented that attention spans at your art tables run short. Shorter than short. Maybe almost nonexistent. 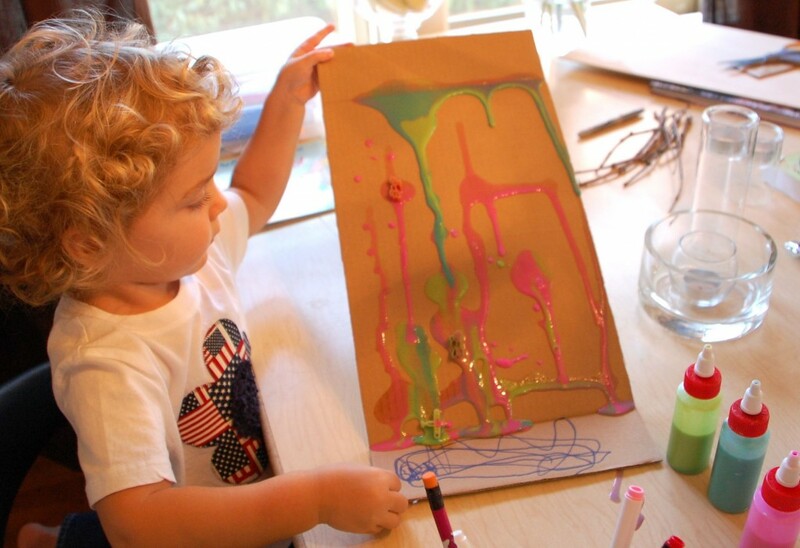 And I want to support you in two ways: one is to say that this is so normal for toddlers and preschoolers to give an art project their 4-minute all, and two is that I must be deceiving you into thinking that my daughter’s interest is sustained over many moons. Not always the case. Rarely the case. Maybe never the case. But I keep on at it. Pulling rabbits out of my hat. Introducing the same materials over and over again to build familiarity. Introducing new materials to keep the interest high. It’s a fine, fast-moving dance between me, her, and the projects — definitely more whirling dervish than Nutcracker Suite. Case in point: this afternoon, between 3:30 and 4:30, we ripped through three completely different painting projects. Three! I set it all up during nap time, and we tore through it all in less than an hour. Drip painting: 10 minutes. Tin Foil Painting: 15 minutes. Marbleized Paper Painting: 15 minutes. Throw in another 20 for clean-up and you’ve got an hour. What a mess! I’ll leave you with Painting Project #1 today…the rest will follow. I added extra water to my Salt and Flour Paint recipe, seen in those squeeze bottles, to make the paint nice and pourable. 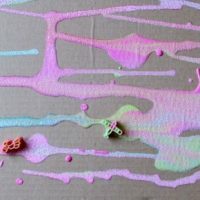 I thought N would enjoy squeezing paint on the cardboard — it’s a nice strong substrate –but didn’t anticipate just how runny the paint would be. What a fun surprise! When N saw the pools of paint, she asked for pasta to stick in the puddles, and then added marker embellishments along the right side. Once she figured out that gravity was at play, she moved the board back and forth then side to side. It’s all about the process, isn’t it. 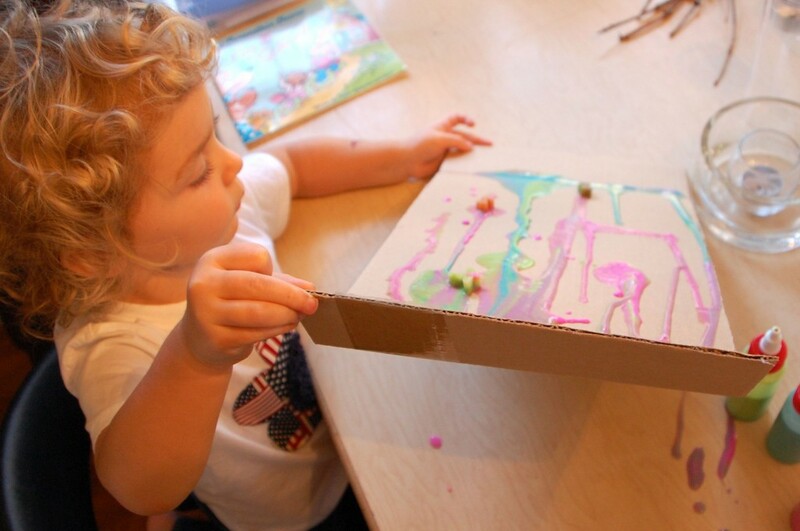 And it’s moments like this that I think I hit URL-gold with the name TinkerLab — toddler and preschool art is so much about tinkering, experimenting, playing, and surprises. We’ll be doing this again, for sure! What kind of tinkering have you been been up to?